Mr TG and I have oft remarked that since I began my foray into the world of mixology, neither one of us is ever likely to fall foul of scurvy, given the vast amounts of limes we habitually consume through the medium of cocktails. Our livers may be the size of an elephant's, but by jingo, our vitamin C levels are through the roof...This week's cocktails all feature cranberry juice which is also high in vitamin C, not to mention antioxidants and flavonoids and has been shown to have an antibacterial effect in the body - admittedly, the health benefits are largely mitigated by the addition of sugar and alcohol, but it does look pretty and it tastes good too. For those of you of an age to have been partying in the 90's, you will no doubt have sampled the delights of cranberry cocktails. 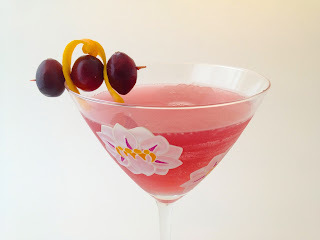 The Cosmopolitan, the Woo Woo and the Seabreeze were all cocktail bar favourites and still persist today, but I wanted to mix up my own drinks, using some of my favourite ingredients. My problem with the aforementioned cocktails is that they all feature vodka, which is fine, but it doesn't bring a lot to the drink other than alcohol content and I wanted to mix some drinks that created new flavours with the cranberry, drawing on that slightly bitter fruitiness. 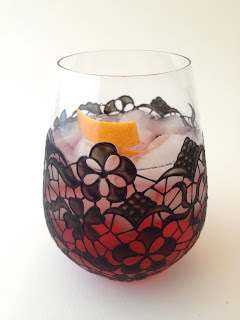 I personally love a cocktail with bitter sweetness to it and am a big fan of Campari and Aperol, so the combination of cranberry with that, works perfectly and creates the most beautiful colour as well. Cranberry and orange work very well together, so the bitter citrus of Campari and the sweeter orange of triple sec in this first cocktail, are a great combination with the juice. I used Williams Chase GB Gin as it's big, juniper and spice notes are fantastic with Campari and the addition of a little lemon juice balances out the flavours. Add the everything except the sparkling water and garnish to the bottom of a shaker or large glass, with some ice and stir until the outside begins to frost. Strain into an ice filled tumbler and add a dash of sparkling water to taste. Cut a strip of zest from the peel of an orange and twist over the drink, releasing the essential oils, and garnish. Add all of the ingredients to a shaker and shake hard for about 20 secs. Strain into a chilled martini glass and garnish with a strip of orange zest and fresh cranberries, as shown. Now I have to be honest and 'fess up that I originally made this last cocktail with Bloom Gin and it was delicious. In my opinion it was even nicer than the rum version, but I absolutely love gin above all other spirits, so I would think that. In the interests of proffering options to those of you who who might want to drink something other than gin, I thought it only fair to try it with rum too and actually, it is very nice. The trick is to use a rum agricole such as the Clément Blanc which has an almost fruity taste to it and to avoid one that might be too nutty in flavour, which doesn't sit well with the Elderflower. 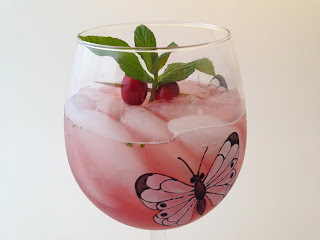 Add everything but the cranberry juice and garnish to a shaker and muddle (gently squish with a blunt ended utensil) the mint with other ingredients. Add a handful of ice and shake for 20 secs. Strain into an ice filled glass and top with the cranberry juice. Garnish with a sprig of mint and fresh cranberries, as shown.